Jon Dorotich was a big, rugged, key defender from South Fremantle who enjoyed a notable football career on both sides of the continent for 17 seasons between 1981 and 1997. Blessed with vice-like hands and a raking left foot, he played in successive Grand Finals for Carlton against Hawthorn in 1986 and 1987; suffering a loss in the first, then taking sweet revenge in the second. After finishing at Carlton, he returned to WA and claimed more glory; as both a 100-goal full-forward, and captain of South Fremantle’s 1997 Premiership team. 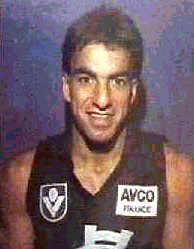 Better known as “Dorra” throughout his career, Dorotich came under notice by the Blues when represented WA against Victoria at Subiaco Oval in 1984. Starting on the bench, he came on to take some telling pack marks as WA held out the Big V by four points in a clinker of a game. The Carlton recruiting machine swung into action, and Dorotich joined the Blues in time to make his debut at centre half-back against Hawthorn in round 1, 1986 on an auspicious day for the Carlton Football Club. Also making their first appearance in navy blue on that afternoon were two future champions in Stephen Kernahan and Craig Bradley, along with Mil Hanna and Bernie Evans. It turned out to be a less than perfect start, however – Hanna wrecked his knee in the first few minutes, and Carlton lost by six goals. But the Blues soon recovered and wound up the year third on the ladder. Wins in the early finals over Sydney and Hawthorn followed, to put Carlton into the Grand Final against the front-running Hawks. By this time Dorotich had already begun a fierce rivalry with Hawthorn’s champion centre half-forward Dermott Brereton, and their clashes were eagerly awaited by fans of both teams. Throughout his career, Dorra never shirked the physical challenges, particularly when he was called to stand up for his smaller team-mates against the likes of Brereton, St. Kilda’s Tony Lockett, Brian Taylor of Collingwood or Roger Merrett from Brisbane. In the ’86 decider however, it was Brereton who took the honours when his team crushed Carlton by 42 points. It took precisely 12 months for Carlton to revenge that humiliation, by downing Hawthorn by 33 points in the 1987 Grand Final. Carlton coach Robert Walls set up the victory with some courageous positional changes, particularly the switch of tall utility David Rhys-Jones onto Brereton at centre half-back. Dorotich was sent to a forward pocket as support for Carlton’s lone ruckman Justin Madden, and it was Dorra’s big effort in the ten minutes before half-time that helped give the Blues a vital half-time lead. With Madden off the ground for a much-needed rest, Dorotich took on the ruckman’s role, competing fiercely and more than breaking even with the Hawthorn big men. Late in the term he charged onto the ball deep in attack, scooping it up on the run and kicking truly for Carlton’s fifth major. Soon afterwards, he initiated another attack that brought up a brilliant captain’s goal for Kernahan – off the ground, from a tight angle. Those goals gave the Blues a confidence-boosting 11-point advantage at the main break, and with Rhys-Jones keeping Brereton completely under wraps, Carlton controlled the match in the second half to run out worthy winners. From 1988 on, Dorotich began spending more time up forward in a potent Carlton attack that featured Kernahan, Dorotich and Peter Sartori as the tall targets, with a host of quick and skilful runners around them. In round 16, 1988 at Princes Park, Dorra booted five goals in a big win over Geelong, but the year ended in dismay with a shock Preliminary Final loss to Melbourne. Although on paper Carlton was still a powerful team, in 1989 the Blues slumped alarmingly to win only twice in the first nine rounds. And when the equally-inept Brisbane Bears knocked us over at home in round 10, Walls paid the price and was sacked. The new man in charge was club legend Alex Jesaulenko, back for a second stint at the helm after leading the Blues to the 1979 flag. Jesaulenko’s strict but effective methods didn’t seem to gel with Dorotich. He was dropped after round 2, 1990 and from then on spent much of the year with the Reserves, playing only seven senior matches. Although he would have been discontented, he finished the year on a high when he was just about best on ground at centre half-forward when Carlton Reserves comfortably beat Melbourne on Grand Final day, to claim our eighth and final lower-grade flag. Another change of coach in 1991 – to David Parkin, also back for a second crack at one of football’s toughest jobs – seemed to spur Dorotich into his best form again. He began in a blaze of glory with bags of five, five and six goals in rounds 2, 3 and 4 respectively, but by the second half of the year had been switched back into defence where he was sorely needed. While Carlton languished on the middle rungs of the ladder in 1992, Dorra had another big season, highlighted by two impressive efforts against St Kilda. In the first, at Princes Park in round 6, he was sent to full-back at half time and quelled a rampaging Tony Lockett, allowing Carlton to overhaul a big lead and beat the Saints by 8 points. Later, in round 21 at Waverley, Carlton trailed the Saints again by 15 points at the main break, so Parkin swung Dorotich from defence to full-forward in the third quarter, and he immediately began marking everything that came his way. Kicking three big goals in that term, he single-handedly sparked the Blues into an 11-goal blitz that put the game out of reach of St Kilda before three-quarter time. Despite that win and a couple of more just as rewarding however, Carlton still wound up in seventh place on the ladder. Dorra finished the year off well, and polled 12 Brownlow Medal votes to be highest-placed among all Carlton players. Although approaching 31, and therefore into the veteran ranks by 1993, Dorotich showed there was still fire in his belly when he up-ended Essendon’s enforcer Dean Wallis in one of the early-season games. Even so, as age and fluctuating form began making their mark, Dorra found himself relegated first to the interchange bench, and then to the Reserves. He enjoyed what turned out to be his last senior match for the Blues in round 15, 1993 against Brisbane at Princes Park. Starting on the bench, he played in bursts in the back half, and had a relatively easy day as the Blues cruised home by nearly six goals. Five weeks later, while playing again with the Reserves, Dorra was reported by an umpire for unduly rough play against a St Kilda opponent, and suspended for four matches. Because that penalty ended his season, Dorotich decided that that was as good a time as any to retire from AFL football – after 132 games, (including that precious Premiership) in the Navy Blue number 6. During that time he had kicked 103 goals, and represented WA in State of Origin matches on four occasions. Remarkably, even then, he wasn’t quite finished with representative football. After a fond farewell from Princes Park, Dorotich returned to South Fremantle, and pulled on the red and white strip of the Bulldogs again after a lengthy absence. Although understandably less nimble than before, his wealth of experience and still-strong hands made him a daunting prospect at full-forward for any opposition defender – as was shown when he was the WAFL’s leading goal-kicker in 1995 with 78 majors, and in 1996 with 88. But it was Dorra’s one special season in 1997 that rounded off his long and successful career. Because of his consistent big bags of goals - and the way they were being scored - Dorotich was selected in the WA state side for the game against Tasmania in Hobart in June. He may have been 35 years old by then, but he ruled the forward 50 on that cool afternoon at North Hobart Oval, as Tassie eventually won a skilful exhibition of football by 47 points. Dorra kicked seven of his side’s ten goals, never stopped presenting for his team-mates, and was a worthy winner of the Simpson Medal as the outstanding player of the match. Perhaps with renewed confidence after that game, Dorotich went back to captaining South Fremantle, and finished off the year in a blaze of glory. The Bulldogs beat their traditional rivals East Fremantle by 7 points in a pulsating Grand Final, and Dorra was the competition’s leading scorer once again with a massive 120 goals. He retired from football after that amazing year – well, almost. Deciding on a comeback in 1999, he managed only one more game before finally calling it quits. Shortly afterwards, Dorra established himself as a popular football commentator in his home state on radio and TV. And as we head into 2010, his media work seems to be evolving in the same way his football career did – because he just gets better with age. Articles: Footy Folklore: Could Dorra have made a difference in 1993? Contributors to this page: Jarusa , Bombasheldon , PatsFitztrick , molsey , WillowBlue , pblue , p(12)terg , dgreen2 , true_blue24 , nikki and admin . Page last modified on Wednesday 10 of April, 2019 23:21:55 AEST by Jarusa. 1982 GF - A concussed Ross Ditchburn is carried from the ground.